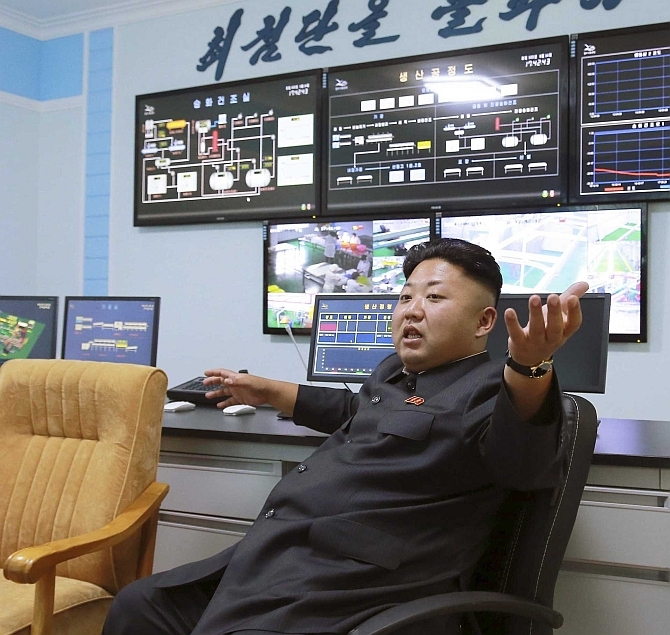 Is North Korea really dismantling its nuclear programme? Rajaram Panda explains the many challenges to denuclearise the Korean Peninsula. PART 1: Is Kim Jong Un under threat from his army? Did United States Secretary of State Mike Pompeo succeed when he made his third trip to Pyongyang on July 7 since April and his first since the Singapore summit on June 12 to talk on denuclearisation issue? As was rumoured, Kim Yong Chol, the senior ruling party official and North Korea's former intelligence chief, remained in office unchanged. This meant, the voices of hardliners remained undiluted. After North Korea, Pompeo also travelled to Japan, Vietnam, Abu Dhabi and Brussels, where he joined US President Donald J Trump at the NATO summit. The visit was to seek clarity on how Pyongyang was planning to dismantle its nuclear programme, besides how to recover the remains of US troops missing from the Korean War. Though Pompeo spent a night in Pyongyang this time -- unlike his previous two visits which were one-day affairs -- no details were provided what transpired during the Pompeo-Chol talks. It also remained unclear for some time if Pompeo met Kim Jong Un as was expected, but later confirmed that he did not. As the Trump administration's top diplomat, Pompeo conveyed that the US was committed to reaching a deal under which North Korea would denuclearise and realise economic benefits in return. Both wished to clarify 'things', but neither gave any explanation what exactly needed to be clarified, though it is not difficult to guess that there was lack of clarity on how 'denuclearisation' would be interpreted to the satisfaction of both. 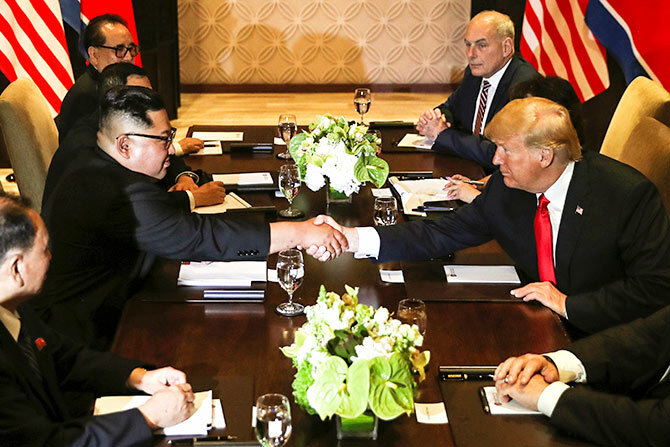 For the US, unless the three basic goals -- complete denuclearisation of North Korea, security assurances, and the repatriation of the remains of American soldiers killed during the Korean War -- are met, no further progress could be expected. This leaves subject to interpretation if it was a departure from its earlier demand that an agreement must cover 'complete, verifiable and irreversible denuclearisation' or CVID. The stopping of the use of this phrase gave rise to speculation that the US had begun to dial back its demands. Despite the three-hour Pompeo-Chol talks and over dinner, no clarity emerged if Kim Jong Un would honour his promise made in Singapore and translate into concrete action. Besides the nuclear issue, Pyongyang is yet to return the remains of US troops killed during the 1950-1953 Korean War already identified, though Kim committed their 'immediate repatriation' at the Singapore summit on June 12. North Korea also does not rejoice if the issue of human rights violation is ever raised. Trump faced criticism from human rights activists for not raising this issue in Singapore. Just before Pompeo's visit, North Korea's State-run Uriminzokkiri Web site warned Washington not to provoke the North with an 'anachronistic human rights racket' when diplomatic attempts are being pursued to improve ties. The issue gets further complicated as no framework or guideposts were agreed at in Singapore for working toward 'complete denuclearisation of the Korean Peninsula'. Trump administration officials deflected criticism of the agreement and described it as the first step in a negotiated process to persuade Kim to give up his nuclear weapons. But if the analyses by researchers and the media suggesting that North Korea is continuing efforts to increase fuel production, build more missile launchers and expand a key rocket-engine manufacturing facility is correct, then Kim's real intentions could be doubted. North Korea's real intentions could possibly be to test Trump's patience and extract maximum concessions, which is why there are no clear sign of any progress on denuclearisation. Be that as it may, the truism is that the Trump administration's plan to dismantle North Korea's nuclear weapons and missiles in a year is both unrealistic and risky. It was not desirable on Trump's part to make the claim soon after the Singapore summit that North Korea was no longer a nuclear threat when there was plenty of ambiguity in the joint statement. Trump was expected to be circumspect keeping in mind that his predecessors have failed to achieve denuclearisation of North Korea in the past quarter century since Pyongyang began producing fissile material for bombs. Further, Pompeo's claim that North Korea would take 'major' nuclear disarmament steps within the next two years before the end of Trump's first term in January 2021 was bullish given Pyongyang's history of evasion and reluctance to allow verification of disarmament agreements. Even Trump's National Security Advisor John Bolton went further and asserted that the denuclearisation process can be completed within a year so that Pyongyang can win sanctions relief and receive aid from Japan and South Korea. Such assertions made in undue haste smacked of diplomatic immaturity. That Trump, Pompeo and Bolton believed Kim without the North Korean leader being transparent meant that they were naive and open to being deceived. 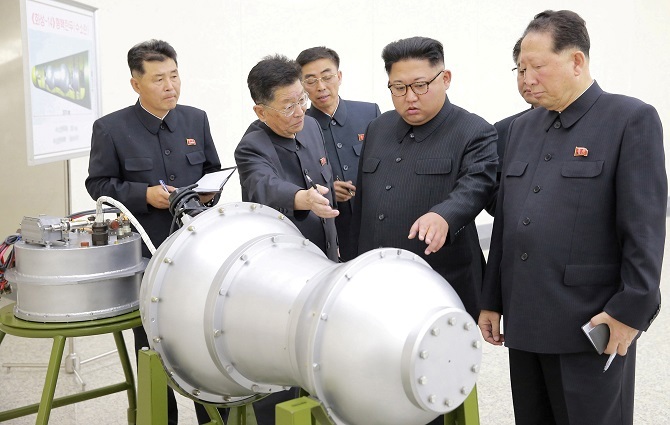 In a secretive regime such as North Korea it is extremely difficult to know exactly the number of nuclear warheads in its possession as well as the existence of undisclosed facilities used to manufacture fissile material for nuclear bombs. Since North Korea and the US have not yet negotiated the terms under which Pyongyang would relinquish its weapons, Pyongyang shall surely seek leverage in discussions. Denuclearisation is no simple task. There is no precedent for a country that has openly tested nuclear weapons and developed a nuclear arsenal and infrastructure as substantial as the one in North Korea to give up its nuclear weapons. If the US overlooks this possibility, it could be to North Korea's advantage. David Albright of the Institute for Science and International Security suggests the US get Kim to disclose a complete list of all his nuclear program sites and materials, including uranium and plutonium. Albright further suggests that Trump and Kim should decide whether to move the nuclear weapons out of North Korea to dismantle them or do it inside the country. Japan's offer to send experts to dismantle and money should be accepted. According to nuclear physicist Siegfried Hecker, a leading expert on North Korea's nuclear programme, the magnitude of dismantling its weapons of mass destruction programmes that encompass dozens of sites is so huge that it could be necessary to have a 10-year roadmap, based on the belief that Pyongyang will not give up its weapons and weapons programme until its security is guaranteed. North Korea's stockpile is estimated to include as many as 60 nuclear devices. Hasty promises or written agreements are not enough to achieve the denuclearisation goal. Kim could still conceal parts of his stockpile and production facilities, intending to preserve a nuclear weapon capability that he views as the ultimate guarantor of his dynasty's survival. There is no sign that Kim has changed his view that possessing a nuclear capability is his best insurance. The root of the confusion is that Trump and Kim did not establish an agreed definition of 'denuclearisation'. Trump seemed to have accepted North Korea's position that a disarmament process encompasses the entire Korean Peninsula, which would include the US military presence in South Korea and the region, not just North Korea's assets. In a fast-track move, Trump agreed to Pyongyang's long time demand, and that of its chief ally China, to stop long-standing joint military drills with South Korea. Since the annual drills are meant to shore up protection for the South against possible aggression from the North, America's two Asian allies in the region -- South Korea and Japan -- were shocked as neither was consulted before such an announcement was made, though it pleased both Pyongyang and Beijing. There were more confusion in store and Pompeo had a tough time answering probing questions from the media. 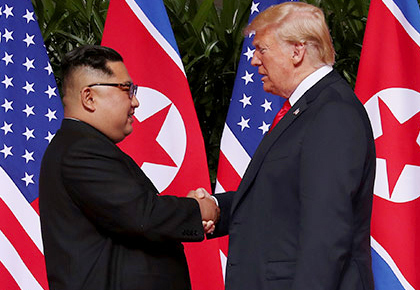 The joint statement signed in Singapore called for 'complete' denuclearisation, but did not include two other elements of the US' long-standing demand that the process also be 'verifiable' and 'irreversible'. Later, South Korean Foreign Minister Kang Kyung-wha clarified that North Korea had balked at a written pledge for 'complete, verifiable and irreversible denuclearisation' for historical reasons, but stressed that the goal remained the same whether that exact phrase was used. Complicating the confusion was the mixed signals sent out by Trump, Pompeo and Bolton by their contradictory statements. The optimism demonstrated by the US in portraying the talks as productive despite obvious setbacks was surprising. No wonder, Pompeo parroted his boss' views in stating that his July 7 talks in Pyongyang with Kim Yong Chol were 'productive', though he admitted that 'there's still more work to be done' to be dealt with by working groups from both sides. But the fact is such groups had been a feature of past nuclear agreements with the North and had served only to postpone their eventual failure. So, forming small working groups means another stalling, ensnaring, tactic to keep the momentum and create the illusion of cooperation. What transpired subsequently was that the definition on the word 'denuclearisation' remained inconclusive. Hours after Pompeo left Pyongyang after calling his talks 'productive', North Korea accused the Trump administration of pushing a 'unilateral and gangster-like demand for denuclearisation' and called it 'deeply regrettable'. While refusing to divulge details of his talks with Chol, Pompeo expressed in private his doubts that Kim would ever give up his nuclear weapons. By blasting Pompeo's claim of talks being 'productive' as 'regrettable' and its 'unilateral, gangster-like demands', Pyongyang was contending that the US was demanding everything and offering nothing, and warned of 'a dangerous phase' that could "rattle our willingness for denuclearisation". The tough talk might have been part of a negotiating strategy and for domestic consumption to appear strong in the face of a long-time bitter foe. Several analysts have endorsed, and with some convincing reasons, Kim's claim of being winner in dealings with Trump, including Kim's recognition on the world stage as a statesman worthy of a sit-down with an American president. Trump's sudden acquiescence to the North's demands for the US to end joint military drills with exercises is cited as another proof of equality. Such vitriolic diatribesm -- this time one-sided though -- show how complex the negotiation with North Korea is. It could take years, if not decades. This throws up the real challenge for Pompeo to decipher what Kim's real intentions could be. If his doubts are real, one is back to square one and the world ought to learn to live with a nuclear North Korea. Seen from this productive, Pompeo's trip have been the least 'productive' as claimed by him. Pompeo was rather circumspect not to provoke North Korea by reacting to the 'gangster-like' remark saying that 'the world is a gangster' because the same demands are part of a United Nations Security Council resolution. The confusion stemmed from the manner in which negotiations took place between Trump and Kim in Singapore with no one present but interpreters. There were no note-takers or aides, something unheard of in the world of high-stakes diplomacy. No one really knows what Trump might have said or promised Kim, leaving analysts to interpret by following post-summit statements by both sides. From North Korea, Pompeo flew to Tokyo where he met with his counterparts from Japan and South Korea, Taro Kono and Kang Kyung-wha. He admitted that denuclearisation would be difficult and that much works remains to be done. Not to spoil the momentum, he shrugged off Pyongyang's 'gangster' rebuke and harshly critical statement, while citing progress. But he reiterated the US stand that there shall be no sanctions relief until Kim's pledge to get rid of his nuclear weapons is met. But it was clear that North's statement undermined hopes for a quick deal and raised questions about Kim's intentions to give up ever his nuclear arsenals. Though Kono pledged to stand 'hand in hand' with Pompeo on nuclear talks 'to the end', and Kang Kyung-wha shared Pompeo's assurance that the shared defence posture would remain 'ironclad' and 'watertight', despite the cancellation of military exercises, the worry in Tokyo and Seoul does not seem to be eased a bit. From Tokyo Pompeo travelled to Hanoi where he made some meaningful statements which North Korea could consider to be in its interests. He appealed to North Korea's leaders to follow Vietnam's path in overcoming past hostilities with the US. He called on Kim to replicate Vietnam's 'miracle' of economic growth by improving ties with the US, vowing that America keeps its promises with former foes. Since the normalisation of relations between the US and Vietnam in 1995, Vietnam has prospered. This has been possible despite decades of conflict and mistrust between the two former adversaries. There are reasons why North Korea cannot replicate Vietnam's path for the nation's economic growth and people's prosperity. If the US continues pursuing a 'maximum pressure campaign' of economic and diplomatic isolation and keeps sanctions in place, it could only harden Pyongyang's stance. UN and US sanctions delete 90 per cent of North Korea's export revenues. But so long as China continues to remain as North Korea's principal ally and backer despite maintaining cosmetic sanctions in place, the geo-strategic matrix could continue to weigh in the North's favour. Amidst all these development, Japan reported on June 29 a suspected ship-to-ship transfer of goods in the waters around North Korea. This is believed to be the eighth instance in 2018 itself. Such clandestine dealings keep the North's economy afloat. The denuclearisation issue is unlikely to be resolved anytime soon. Dr Rajaram Panda, former Senior Fellow at the IDSA, was until recently ICCR Chair Professor at Reitaku University, Japan. He couldn't give a damn for what the world thinks! A bomb worse than an atom bomb in Kim Jong-un's hands!